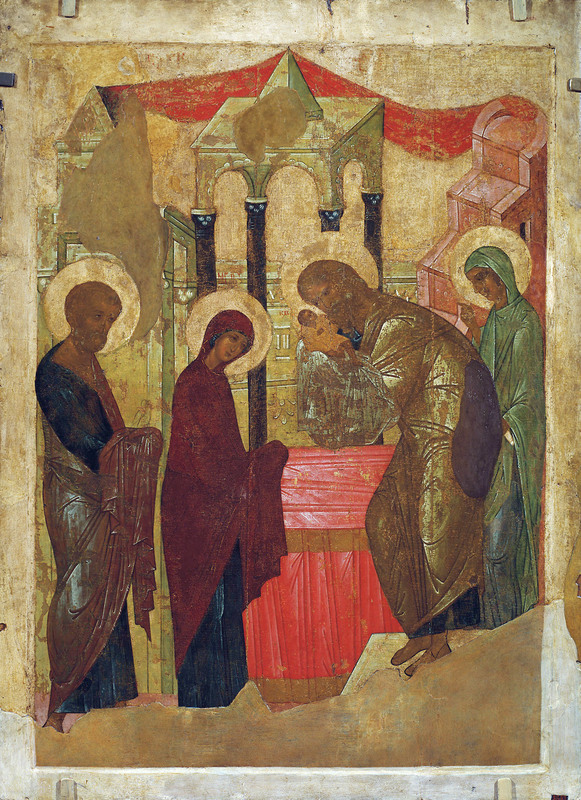 In common with all pious iconographers, Rublev did not paint for glory, profit, or fame, and did not sign his works. Yet the style of Rublev’s icons are so distinctive, so beautiful, that he inspired a whole school of iconography which is instantly recognizable. St Andrei was born near Moscow in the 1360’s, and as a young man entered the newly-founded Monastery of the Holy Trinity. It is here, as a monk, that Andrei strove to fulfill the high calling of letting God speak to people through his icons. Such a calling can only be fulfilled through overcoming self-centeredness (that gets in the way of God speaking through them) by strict fasting, abstinence, prayer, frequent reception of the Holy Mysteries, helping the needy, and by cultivating the spiritual attitudes of humility, patience, joy, peace and love. It is a beautiful irony that through such selfless humility – following the canons set down by previous iconographers without innovating – St Andrei would paint Icons so distinctive. The powerful serenity of the Holy Trinity, the Angels, and the Saints captured by Andrei captivated others and his style soon spread throughout Russia. Andrei Rublev died on January 29, 1430. He was honored as a Saint immediately by his brethren at the Holy Trinity Monastery, yet outside of the local area his name was forgotten. Throughout Russia, churches were adorned with countless images either painted by him, or influenced by his style – yet the life and even the name of St. Andrei Rublev was forgotten. Many of the images painted by him were covered in jewels, hiding in glitz the power of their simple beauty; the wooden panels of St Paul and the Archangel Michael (shown above) became blackened with centuries of dirt and hidden from view – as did the Icon of Our Saviour. It was only in the late 19th century that these icons were rediscovered, and only in the 20th century – 1988 in fact – that Andrei was universally acclaimed as a Saint by the entire Orthodox Church. It is no coincidence that the years in which Andrei was revealed once again as a saint mirrored the 14th century in terms of brutality, war, and horror. It was certainly during the terror of Soviet times that Russians most needed to experience once again the divine beauty expressed by Andrei Rublev. And so it happened. This entry was posted in History, Iconography, The Saints and tagged Holy Trinity, Iconography, Rublev, Russian Icon, Stylism. Bookmark the permalink. I’m interested in seeing the Rublev Life of Christ Icons from the church where the famous Trinity icon is. the BBC show on Russian Art briefly showed them and I’d like to explore them more, but I’m having trouble googling them, do you by chance know of some website or other (book) resource that I can review them? But it should be remembered that precious few icons can be directly attributed to the hand of Andrei Rublev’s; however, the icons painted in a style *inspired* by Andrei Rublev are countless. Most “Rublev Icons” belong to the latter category. Do you know where the icon of St Andrei Rublev may be purchased?